Electronic Arts has agreed to wait on completing any potential acquisition of Take-Two until the Federal Trade Commission has completed its investigation of the possible merger, the company revealed today through an SEC filing. Under the agreement, no transaction will be completed until the FTC has finished its probe, which can take up to 45 days instead of the customary 30. 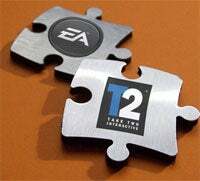 "We've entered an agreement with the FTC to modify the scope," said an EA spokesperson. "This is a normal part of the review process, which allows us to move through the review as expeditiously as possible while giving the FTC additional time in which to complete its full review and work." At the time EA last extended its tender offer until June 16th, corporate development VP Owen Mahoney said the extension would allow the FTC further time to complete its investigation. However, there are only 7 business days between now and the expiration of EA's current offer, not 45 - so it's reasonable to infer EA will extend its offer again to allow the FTC to fully complete its probe. EA declined to comment on plans to extend the offer, but the spokesperson said, "You'll hear from us on or before the expiration." The FTC also does not comment on the specific details of individual investigations.